Well now, this seems to have come out of nowhere: Carnal, Volume 1: Pride of the Lions, written by Jason Bergenstock and illustrated by John Connell. 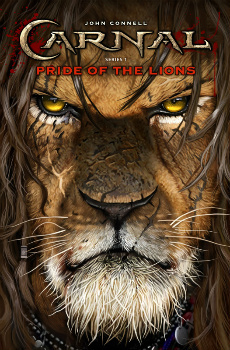 Here’s the description from an article by Mother/Writer/Gamer: “The first graphic novel in the Carnal series, Pride of the Lions takes place on the continent of New Africa and focuses on three main species of humanistic animals. After the Great War decades earlier between the hyenas and the lions, the victorious and once united lion prides now lay scattered across the land, torn by civil unrest over territory disputes and food shortages. The hyena clans that survived the war were forced deep into the Earth and now live in a massive underground city under the control of a terrible witch. The buffalo race is indifferent to most other species and have walled themselves off from the rest of the kingdoms. Humans have lost their hold on the African territories long ago and live as a simple, nomadic species. The first book opens with Long Eyes, an old sapphire-eyed lion who is determined to save the lion kingdom and rescue his warrior son, Oron, who has gone missing. Long Eyes believes Oron is the key to uniting the prides. A young lioness tracker named Omi is sent out with the protection of two lion brothers to locate the missing warrior, but what they find is something that may unravel the very foundation of life for all species.” This hardcover graphic novel is available for pre-order from Sea Lion Books. It’s arriving in stores this coming May.